Among the many watchdog organizations that study corruption around the world, Berlin-based Transparency International (TI) publishes an annual ranking of countries in itsCorruption Perceptions Index. In 2015, TI ranked the United States 16th of 167 countries. Except for Canada, Singapore, Australia and New Zealand, all of the countries that ranked ahead of the US were in Western and Northern Europe, with Denmark, Finland and Sweden achieving the top scores. 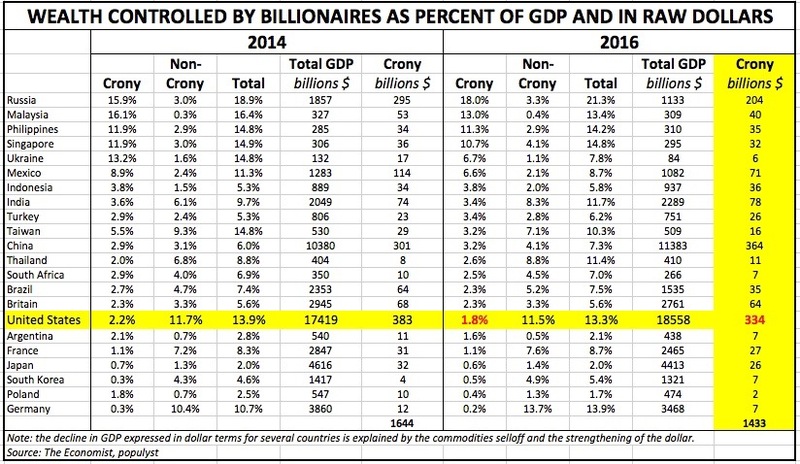 In order to answer this question, we try to estimate the size of the crony economy in the US. This is a difficult endeavor because there are few sources that can be helpful in measuring and quantifying cronyism. The Economist gave it a good try by developing acrony-capitalism index in 2014 and by updating it in 2016. This piece first appeared at Populyst.net. Submitted by Harvey Marx on Fri, 09/09/2016 - 02:27. You're allllmost there, now just say the words "charter schools." People talk about cronyism all the time but they never seem to mention the toast of intellectuals everywhere - turning over a public, democratically-controlled institution to private for-profit operators (and donors) who achieve little to no improvement over the previous system and enjoy even less accountability for the results. Submitted by Low Budget Dave on Wed, 09/07/2016 - 08:11. Good article, and good use of examples. The only bone that I have to pick is the inconsistent use of”-ism”. 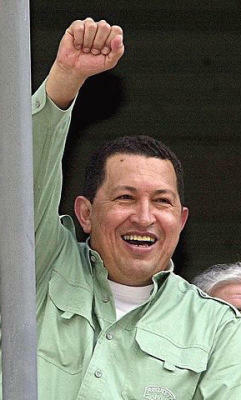 In the first part of the article, you said that Socialism is the ultimate manifestation of the “disease”. Later on in the article, you said that the word “capitalism” is not really a fair word to use, because the debate process itself has changed the meaning of the word. If you are going to use the failures of Chavez to define the nature of Socialism, then why do you exempt laissez-faire capitalism from the worst of its failures? You correctly pointed out that the Wall-Street bailout was a failure of cronyism, but you neglected to mention why the bailout was necessary. The asset bubble that destroyed the mortgage derivatives market was not a failure caused by overregulation, it was a failure caused by deregulation. In fact, many market failures ranging from offshoring to fracking to asset bubbles are caused by corporations that have figured out how to impose the cost of their activities on the government (or the environment, or the public, or whatever). The main culprit in each case is not the excesses of government regulation, but rather the errors of de-regulation. The fact of the matter is that laissez-faire capitalism has inherent weaknesses. These weaknesses are not as serious as “Lets-nationalize-the-oil-companies” Socialism, but they still require serious discussion. And changing the terms is more frequently an excuse to avoid the discussion than to engage.